ESGI Media: Samsung NX1 Firmware v1.31 Now Available! Samsung NX1 Firmware v1.31 Now Available! Along with a firmware update for the Samsung NX 16-50mm f3.5 Power Zoom Lens. I must admit, I'm loving Samsung's firm (get it) commitment to their flagship. 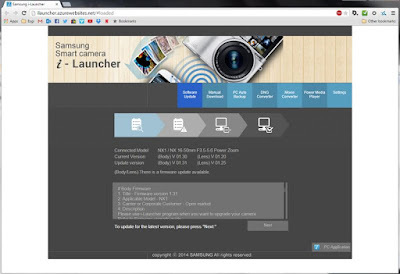 As usual, you can install the new software using the i-Launcher app by connecting your NX1 to your computer via USB or you can also use NX1's built in Wi-Fi update feature. If you would rather download the file directly and do it offline, the link (for the UK firmware) is HERE. Please use i-Launcher program when you want to upgrade your camera. Refer to Firmware upgrade guide. [Caution] During upgrading firmware, a camera turns itself on and off two times. Do not cut off the power and Do not remove battery before complete message. 1. Improved "Color Temperature" of White Balance. 16. JPEG, RAW (JPEG only), and Video transfer via WiFi Actual RAW file does not transfer via WiFi. It only transfers JPEG file with Picture Wizard setting embedded to smartphone. 5. Improved the purple noise issue of UHD 23.98p Movie size in the dark condition. 17. Depth of Field Preview and Delete buttons are customizable and additional functions are available on custom buttons. User can also position the sensitive area where they would like to begin tracking a subject from. If subject moves out of selected area AF continues tracking. a. Added AF Release Priority function (Auto/Accuracy Priority/ Shooting Speed Priority). This is the latest LENS firmware. To maximize improved firmware performance, body firmware should be the latest version. Samsung NX500 Firmware Update Available! Sony! α7R II + RX10 II + RX100 IV = 14bit Raw?